filtering action, allowing bacteria to pass through. Membrane filters overcome some of those drawbacks. Membrane filters composed of compounds such as cellulose acetate, cellulose nitrate, polycarbonate, and polyvinylidene fluoride have been developed recently and have largely replaced the use of depth filters. The filters are relatively inert chemically and absorb very little of the suspending fluid or its biologically important constituents such as enzymes. Paper-thin membrane filters are produced with graded pore sizes extending below the dimensions of the smallest known viruses. 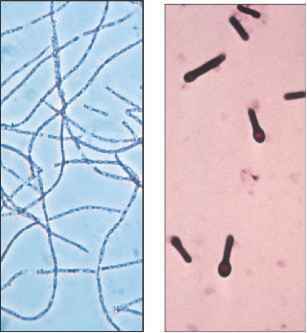 The most commonly used pore sizes for bacterial filters are 0.4 and 0.2 micrometers (mm). Membrane filtration of beer and wine results in a clear liquid free of spoilage microorganisms. Since pasteurization is unnecessary, filtered beer can be marketed as "draft" beer in bottles and cans. Some heat-sensitive medications are also sterilized by membrane filtration. Special filters called high-efficiency particulate air (HEPA) filters remove from air nearly all microorganisms that have a diameter greater than 0.3 mm. These filters are used for keeping microorganisms out of specialized hospital rooms in which reside patients who are exquisitely susceptible to infection. They are also used in biological safety cabinets, laminar flow hoods, in which laboratory personnel work with dangerous airborne pathogens such as Mycobacterium tuberculosis. A continuous flow of incoming and outgoing air is filtered through the HEPA filters to contain microorganisms within the cabinet. Biological safety cabinets are used not only to protect the worker from contamination by the sample, but also to protect the sample from environmental contamination.